“Gender mainstreaming is bringing more children back to school, ensuring women’s participation in decision-making, and overall how we can contribute to the development of Afghanistan,” said Zohal Hashemi, Director of Human Resource Development at the Afghanistan Ministry of Education. 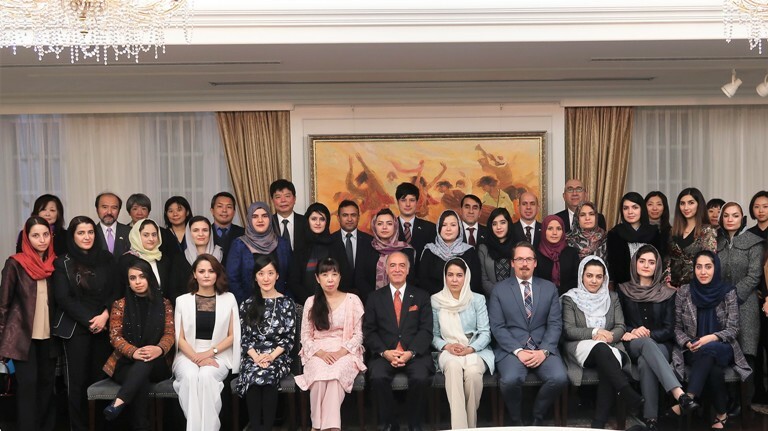 “In this workshop, we learned what our responsibilities are and what we should do.”Zohal is one of 20 participants who took part in the UNITAR Women’s Leadership Programme for Afghanistan: Governance and the Sustainable Development Goals (SDGs), which was held in Hiroshima and Tokyo from 28 November to 8 December. All participants were young women working in Afghanistan; they represented a diverse range of organizations from both Kabul and the provinces, including the Office of the First Lady, the Afghanistan Women Chamber of Commerce and Industry, and Zan TV. The programme is supported by the government and people of Japan. Although gender issues in Afghanistan have seen recent improvements, 87 percent of women experience physical, sexual, or psychological violence during their lifetime, only 19 percent of women participate in the labor force (2016), and only 17 percent of all Afghan women are literate, according to UN Women Afghanistan. Against this background, the United Nations Institute for Training and Research (UNITAR) Hiroshima Office programme aims to empower Afghan women to be changemakers in their workplaces and communities through offering training on leadership, good governance, and the SDGs. All of the programme’s subject matter was examined through a gender lens, such as what makes effective women leaders and how each of the SDGs — not just Goal 5: Gender Equality — is impacted by gender. Participants developed detailed, concrete action plans, which they presented on the final day of the workshop. Action plans ranged from training young women on job interview and CV writing skills to decrease female unemployment, to providing safe-houses for children so that they are not forced to become child laborers. Many commented that they were eager to implement their actions plans as soon as they return to Afghanistan. The programme included a number of study visits to, and guest speakers from, various organizations working on gender issues. In Tokyo, the group explored lessons learned with representatives from the Gender Equality Bureau of the Cabinet Office of the Government of Japan, the Japan International Cooperation Agency (JICA), and the Japan Civil Society Network on SDGs. In Hiroshima, participants visited the Hiroshima Prefectural Government Work Style Reform Promotion and Working Women Support Division, as well as Essor, the Hiroshima Women’s Center working for gender equality. Resource Persons from UNITAR, UNDP, and the Gender Action Platform also led sessions during the workshop; they spoke with participants about gender, governance, action plan development and leadership issues from an international perspective, giving participants key information on how to successfully promote gender-based projects and policies.